Hardys Public House is a relaxing pub offering moreish pub food and a good selection of drinks. Do you work at Hardys Public House? What did you think of Hardys Public House? A self-proclaimed “old man’s pub” in eastern Greenwich, which nonetheless boasts good food and a friendly atmosphere. 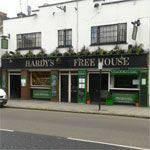 Situated on Trafalgar Road, not far from Greenwich Park and a particularly scenic stretch of Thames pathway, Hardys is a staunchly old-fashioned boozer, the kind that doesn’t even seem to have windows (it does, of course, but the stained glass bathes everything in an eerie yellow hue). The space consists of a long, narrow room with green baize carpets, flanked by well-worn booths and tables on one side and a wood and glass bar on the other. Along with the requisite TVs, mirrors and framed prints of the Greenwich area, Hardys is also decked out with vintage paperbacks and inscrutable Gaelic road signs, as well as a dartboard on the brick pillar near the main entrance. The overall effect is interesting, if nothing else. Very much an old man’s pub – and proud of it, if the “grumpy old men’s club” sticker above the bar is anything to go by – Hardys isn’t exactly first-date material, but it is not without its charms. Despite the rather claustrophobic lighting, it proves to be a good spot to catch up with friends, watch sport and play darts, and the staff are extremely welcoming. Things definitely pick up after working hours and at weekends, with a strong local contingent and the occasional live band on the small stage towards the back of the room. Head chef Tom (also responsible for the Green Pea restaurant next door) is extremely vocal about the quality of his food, and with good reason – although the freshly-prepared pub grub isn’t going to be troubling the Michelin board of evaluators any time soon, it is tasty, wholesome and delivered in generous portions. Highlights include the ever-changing roster of home-made pies (the beef and Guinness variety goes down particularly well) as well as burgers and racks of lamb, all for around £8-£10. The saloon-style signs promising “WHISKY” do not disappoint, with a comprehensive cross-section of UK distilleries represented at reasonable prices. Elsewhere, the lager doesn’t stray from the usual Fosters and 1664 (£2.80-£3.40), but there are several guest ales to round out the drinks list, as well as an extensive, if rarely sought-after selection of wines (starting at £3.20 a glass) and spirits in overhead racks. Roguish and rough around the edges, Hardys makes up for a slightly dingy atmosphere with good company and great food, away from the tourist hot-spots of central Greenwich.